[By Nick] For some odd reason, I’ve been craving coconut lately. You all know I’m not a fan of coconut at all but I’ve just been having these urges. It has been awhile since we’ve featured So Delicious on the blog so I decided it was the perfect time to pick up another one of their coconut milk non-dairy frozen dessert pints. My selection of So Delicious products is limited so I thought it would be a good idea to go with something I’ve had my eye on since I first tried their flavors: Cookies N’ Cream. There’s nothing more classic and satisfying than a good cookies and cream. So Delicious has surprised me twice now so let’s see if the third time is just as good. Removing the protective seal reveals a nice looking cookies and cream base. It’s almost the right shade of grey. It’s just a tad bit off of what I’m expecting but that’s a petty argument. There’s also really nothing hinting towards this being coconut milk ice cream. All of that changes once you take your first bite. The coconut makes itself known. While not as tame as in Turtle Trails, it’s still not overbearing like I feel coconut can tend to be. You do get hints of vanilla every now and again but the coconut is still the dominate flavor in this pint. And you know what? I’m fine with it. I never thought I’d be able to say that I enjoyed the taste of coconut as the main flavor but I guess this blog is really changing me. As for the sandwich cookies, they add a chewy texture and some much needed bitterness to keep the sweet coconut flavor in check. Their size ranges from little bits to about the size of 1/4th of a whole cookie. The combination of chocolate and coconut isn’t a new one by any means but I don’t think I’ve ever liked it as much as I do with this flavor. This just further proves that cookies and cream can be made with just about any kind of base. Speaking of the base, this one doesn’t seem to be as creamy as the first two I’ve tried. It’s not icy or anything; it just doesn’t seem as smooth. I’ll just blame it on the surplus of chocolate sandwich cookie bits throughout it. Once again I have to hand it to So Delicious. They’re slowly but surely turning me into a coconut convert. Here’s hoping that trend continues as I further explore their offerings. 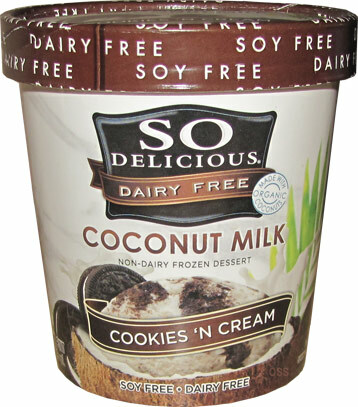 I used to eat Soy Milk ice creams from So Delicious when I was vegan a few years ago and have found their products to be of excellent quality. 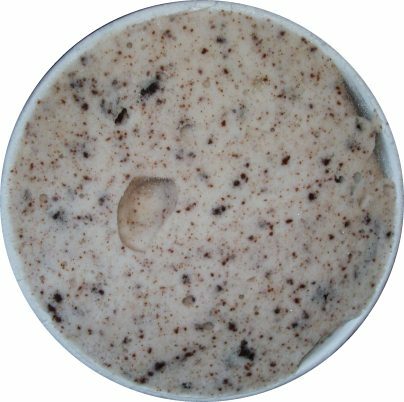 I wish they wouldn't have discontinued the cookies and cream soy ice cream quart that they used to make. Thanks for reviewing a vegan treat! Glad to read that you were open-minded about the coconut flavor, too, and that you enjoyed it. @Stride: I've been pretty impressed with the flavors from So Delicious I've tried. I'm very open when it comes to trying "alternative" ice creams so if you have any suggestions, let me know! I eat this ice-cream pretty much daily, except I eat tbe almond milk version and it is MUCH MUCH creamier. I think you might enjoy that one better. @Anon: I want to try the almond milk one so badly. Almond milk is actually my milk of choice. No one seems to carry the c&c around me. The only ones I've seen are the plain vanilla and chocolate. I might have seen the mint one but I'm not too sure. @Anon: The Almond Milk ice creams have less saturated fat than the coconut milk ice creams and so are a healthier version, too. @Nick: The Soy Milk Chocolate Peanut Butter one is definitely one I'd like to see a review. This is no longer carried where I live but when I did have the chance I did try it years ago. I'd be interested in your opinion. The vanilla and chocolate almond milk ice creams are all ones you can review, too! Hey Nick, did you see any at Healthy Living Market? I know Whole Foods sometimes has some of their stuff, and I think Wegman's has a respectable selection too. @Stride: Technically the coconut milk ones contain healthy fats so that's all negotiable. The only soy milk flavor I've found is their cookie dough which I've already reviewed. I have seen the coconut version and have been considering picking that one up. @Dubba: I really can't remember. I think I was too distracted by all of the Jeni's flavors aha. And stop teasing me with all your grocery stores. You know I don't have either of those stores! I enjoy the SO Delicious soy products but find the coconut ones just don't have enough 'creamy' texture, almost like water. 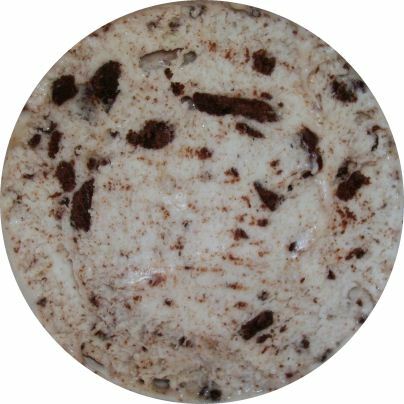 you should definitely try the almond milk cookies n cream. AMAZING!! !